2009: NDP during President Obama's first term. 1 criticism made; 2 hoaxes perpetrated. "... President Obama has decided that there will no longer be a 'National Day of Prayer' held in May. He doesn't want to offend anyone... As an American Christian, 'I am offended'." Snopes listed this Email as "false." 1 They define their web site as "... the definitive Internet reference source for urban legends, folklore, myths, rumors, and misinformation." WASHINGTON -- Congress' official designation and the President's predictable proclamation of a National Day of Prayer is misguided and unnecessary, says a Washington, D.C.-based church-state organization. In 1952, Congress passed a joint resolution, signed by President Harry Truman, setting aside one day a year for prayer. Since then, presidents have proclaimed a day for prayer annually observed on the first Thursday of May. The administration has announced President Obama will sign a proclamation but will not hold an event this year. 'There is nothing wrong with the American people getting together to pray on a designated day, even public officials,' Walker said. 'In fact every day should be a day of national prayer. President Obama, like others before him, welcomes prayers for our country and its leadership. He has expressed his personal appreciation for such support, and people of faith feel called to pray for our country. "The problem with the National Day of Prayer is that it is an official act of the government urging citizens to engage in a religious exercise,' Walker said. Walker said people of faith do not require the government's stamp of approval for their religious practices. 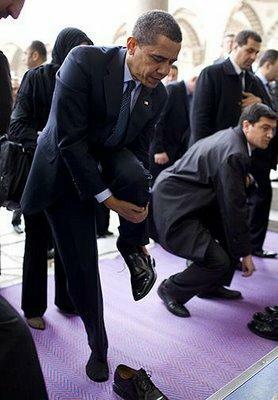 "PHOTO: Obama prays to Allah... This is our President at an 'Islamic Prayer Day' session LAST WEEK AT THE WHITE HOUSE. Oh, yes, Obama prays all right: WITH THE MUSLIMS!! This is OUR President at a MOSQUE prayer session LAST WEEK AT THE WHITE HOUSE, on the site where the INAUGURATION is held every 4 years! "He canceled OUR CHRISTIAN 'NATIONAL DAY OF PRAYER' ...Now THIS. For Obama to continue as our president is an INSULT TO OUR FOUNDING FATHERS." There is no such event as an "Islamic Prayer Day." Devout Muslims are expected to pray five times every day. In the picture's background, there are architectural shapes that are typically found in an Islamic mosque. This would be a strange design for the White House where the picture was allegedly taken. In fact, the photo was taken in 2009-APR at Istanbul's Blue Mosque that President Obama visited briefly while in Turkey. Protocol requires that visitors remove their shoes before entering the building. This particular hoax might have been suggested by a prayer service held on Capitol Hill by a group of Muslims during 2009-SEP. It was organized independently from the White House and Congress. His proclamation, dated 2011-APR-29, recognized people of all faiths who pray and those who do not. This is a common theme in a few of his statements, starting with his inauguration in 2009-JAN: that some Americans are affiliated with faith groups, and others are not; some pray to a deity, and others do not. Some adults who association nationalism with conservative Christianity object to the recognition of non-religious people. "... from the earliest years of our country's history, Congress and Presidents have set aside days to recognize the role prayer has played in so many definitive moments in our history. On this National Day of Prayer, let us follow the example of President Lincoln and Dr. King. Let us be thankful for the liberty that allows people of all faiths to worship or not worship according to the dictates of their conscience, and let us be thankful for the many other freedoms and blessings that we often take for granted. ..."
"At a prayer breakfast in Fort Myers, FL, about 1,400 people listened to 1964 U.S. Olympic gold medallist Billy Mills speak about how his upset win in the 10,000-meter run in Tokyo was 'a gift from a higher power,' Dennis Culver of The News-Press reports. 'What do you do when you've been given a gift from a higher power? You give back,' Mills said. Mills, 72, spoke of prejudice he faced as a Native American. Near the end of the event, Lia Willetts, pastor at the First United Methodist Church in downtown Fort Myers, made an unscheduled trip to the podium and criticized event organizers for not including women and black speakers this year. 'He inspired me,' Willetts said of Mills. 'He told the story of the women and the minorities in the United States. We want to be an inclusive country, but we are not there'."